88, passed away peacefully on May 22, 2018. She was born in Honolulu, HI on September 9, 1929 to Suekichi and Tsuya Kuwamoto and grew up in Kalihi. Lillian helped out at her parents' Kalihi Bakery until graduating from Farrington High School in 1947. She attended sewing school for several years and became a skilled seamstress. She was also an accomplished singer and performed with the all-female Shojo Orchestra. Lillian met her future husband, Walter Okazaki, on a blind date. They married in 1956 and soon moved to Los Angeles, CA while Walter attended Northrup Institute of Technology. Upon their return to Oahu, Lillian became a full time mom, raising four children. Later, she began working part time for the Department of Education and then full time at Sears Roebuck at Pearlridge, retiring in 1999 with over 25 years of service. Lillian loved life and always had a smile for everyone. She also loved her garden, where she grew a variety of flowers orchids, ginger, roses, gardenia, pikake, pakalana and bougainvillea. 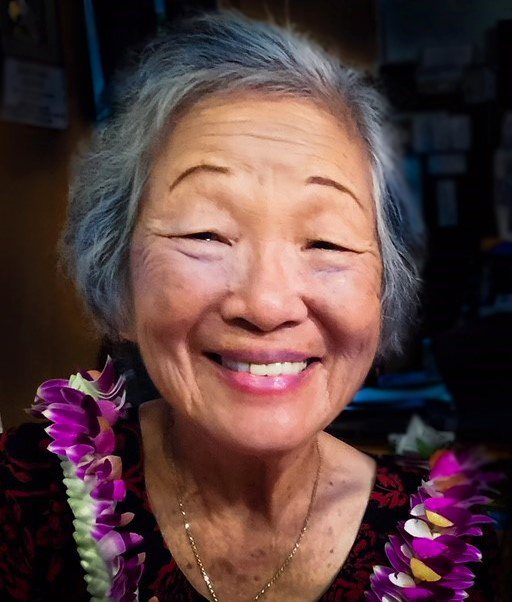 She was a devout Buddhist and belonged to the Waipahu Hongwanji Mission, where she participated in a myriad of activities hosted by the church, among which was her beloved Karaoke Club. Surprisingly, Lillian also loved sports especially football and golf, which she watched on TV whenever she could. She also mastered her iPad in order to pursue her favorite word search and mahjong games. But her biggest passion in life was running. She participated in countless 5K and 10K events, but her proudest moments came from crossing the finish line at the Honolulu Marathon not just once, but four times all after she turned 40! She is preceded in death by her husband, Walter and is survived by her children, Melanie (Eugene Villaluz), Lianne Whang, Wynn and Keane, one grandson, Nicholas Whang, and her dog & best friend, Busta. The family would like to extend a special Mahalo to Dr. Dipak Ghelani of Kaiser Moanalua and Howard Araki, RN, of St. Francis Hospice for their kind and compassionate care as well as to the team of caregivers from Safe Harbor Homecare who treated Lillian with gentle hands and great respect. A memorial service will be held on Saturday, July 28 at the Mililani Mortuary, Mauka Chapel, with visitation at 5:00 pm and services at 6:00 pm. Aloha attire.